Commuting to work in Boston is time-consuming and difficult for so many people. Trying to find the perfect town which fits your family’s needs but is also easily accessible to work can be tricky. If you are planning on moving and are experiencing some of these similar struggles, then this is the blog for you. 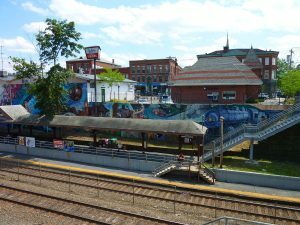 We have put together 5 popular commuter towns accessible to the Boston area. We are taking into consideration the town’s school system, affordability, access to the city, available activities and more. Burlington has become increasingly popular over the past couple years. It has a highly developed commercial space and nightlife activities while also being a great place to raise a family. The closest commuter rail to Burlington is at Atlantic Ave & Commerce Way in Woburn. The average commute time is 22 minutes and about 30 minutes driving depending on traffic. The median home value is $439,400 with their school system ranking at an A+ from Niche. Natick was ranked an overall A+ by Niche in the top 25 best places to live in Massachusetts in 2018. They received A’s in both their public schools and a great place to live for families. The median home value is $474,600, with their median rent being $1,308. Natick was also ranked #13 for best suburb for millennials. There are two commuter rail stations in Natick. Natick Center is conveniently located at 1 Walnut Street in the quaint center of town, depicted on the right. 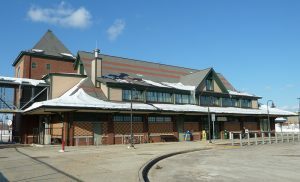 West Natick is located at 249 W. Central Street, which is more accessible to those on the Framingham line and is a great alternative to the Downtown Framingham Center station which is often crowded. The commute time runs about 26 minutes on the commuter rail and about 30 minutes driving with low traffic congestion. Lynnfield has made our list because of its great school system which is ranked top in the state. Be aware that it is one of the more expensive towns on our list. It may not be the best option for people that have a tighter budget. The median home value is $591,400. Lynnfield is very accessible for North Shore folks to both I-95, Route 1, and the Mass Pike, taking only about 40 minutes to get to Boston. 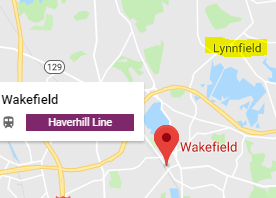 Although there is no commuter rail service within town, the nearest service can be found on the Haverhill/Reading Line of the MBTA Commuter Rail just west of town in Wakefield located at 225 North Ave.
Norwood was ranked an overall A by Niche. The school system received the same high grade as well. 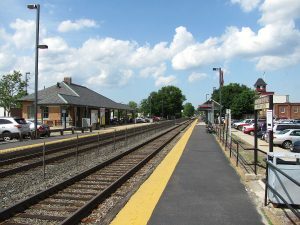 Both the Norwood commuter rails are located at Norwood Central, just a short walk from our Norwood Office on Broadway Street in the center of town, and Norwood Depot at 14 Hill Street. Route 1 and I-95 are two main highways that run through Norwood. The average drive time from Norwood to Boston is 33 minutes with minimal traffic. The median home value is $391,600 with the median rent being $1,350. Quincy is considered very up-and-coming in recent years. It was ranked #10 for best suburbs for millennials in Massachusetts in 2018 by Niche. Median home value is $366,500, with the median rent being $1305. 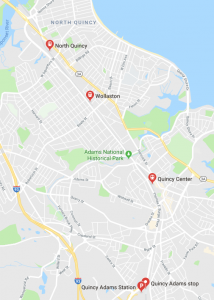 Settling just outside of Boston, commuting to Boston is made very easily accessible to residents of Quincy. You enjoy all the great amenities of the city; restaurants, nightlife, and numerous things to do, without the high cost of living. The drive time to Boston is about 15 minutes depending on which part of Quincy you are coming from. 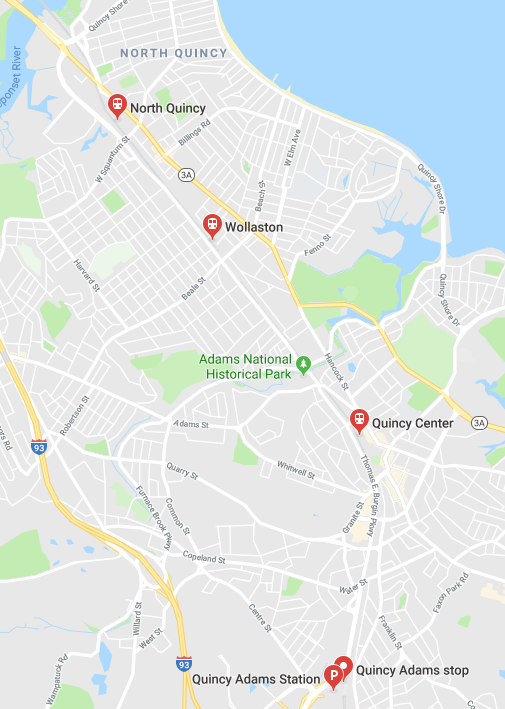 Quincy has four train stations located in Quincy Center: 175 Thomas E Burgin Pkwy, North Quincy: East Squantum Street between Newport Avenue and Hancock Street, Quincy Adams: Burgin Parkway at Centre Street and Wollaston: Newport Avenue at Beale Street or Cleveland Street off Hancock Street. We have local agents all over Massachusetts, with area-specific knowledge of these towns. Interested in minimizing your commute and buying a home? Contact us today!